These days, what happens to your business partners can affect your success. A business strategy consultant explains how to take external risks into account when you plan for the future. What happens when you discover that your biggest client is cannibalizing your product? This happened to one international technology company. It threw the leadership into an intense conversation about strategy. They emerged from the discussion with new resolve: to plan for the future based not just on the company, but on the ecosystem in which it operates. The concept of the corporate ecosystem has appeared in technology journals for years. Simply put, it's the idea that today's companies are embedded in multiple, complex relationships that make them interdependent on each other for success. But it's only recently that corporate leaders are realizing that an ecosystem is more than a concept. The ecosystem has intense implications for how companies plan for the future, and they ignore those implications at their own risk. Traditionally, executives worried about competition from rival firms. It was a straightforward world: the firm controlled its resources, advantage derived from a company's assets and organizations made money based on their ability to deliver value within their supply chains. Novell joined forces with IBM on an ambitious open-source project while collaborating with IBM rival Microsoft to boost Windows-Linux interoperability. Salesforce opened its Force.com developer site, building interdependencies with organizations as varied as CRMfusion, with six employees, and Electronic Arts, which earned $3.1 billion in 2007. Keane provides application outsourcing services to Miller Brewing Company, creating a dual-sourced IT workforce with staff from both Keane and Miller. By creating deep alliances, each of these organizations realizes value beyond that which it could deliver independently. In fact, Siebel Systems' founder, Tom Siebel, attributed his company's explosive growth between 1997 and 2000 to its web of relationships. A web of consultants, technologists, system implementers and suppliers collaborate with Siebel to bring their products to market. Not only does Siebel incur lower staff costs, it also gains the innovation and loyalty that come from engaging people along the value chain. The flip side, of course, is that organizations engaging in deep collaboration tie their fates to the success of the ecosystem, not just their own success. For example, if Microsoft were to go under, there would be a lot of companies in trouble: systems integrators, value-added resellers, software trainers and so on. If your company's fate is intimately tied to that of other organizations, some of which are your competitors, you're going to think differently about their success. To bring this thinking into your next planning effort in a productive way, start with a simple vulnerability assessment. The purpose of the vulnerability assessment is to identify the companies, industries, organizations and issues upon which your organization depends in order to be successful. Brainstorm the events that could disrupt your organization's operations, impede its ability to deliver or undermine its profitability. Let's walk through the process with the hypothetical EdgeTek Corporation. EdgeTek produces ancillary hardware, most important, the cords that connect MP3 players to car stereo systems. EdgeTek's ecosystem-the organizations with which it has interdependent relationships-includes its assembly plants in China, car manufacturers, MP3 manufacturers and even local universities that provide a source for new talent. With the list of disruptive events in hand, the next step for EdgeTek is to determine the likelihood any of these events will occur. MIT professor Yossi Sheffi and MIT Center for Transportation and Logistics director James B. Rice Jr. have recommended creating a map with two axes: probability of risk and consequences of risk. Risk Map for "EdgeTek Corporation"
Looking at the map, we see a high probability for five events. 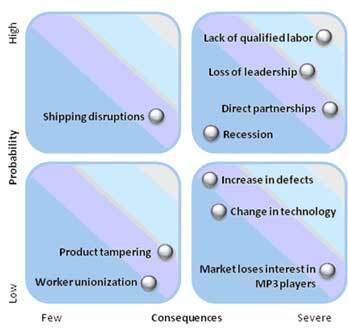 Of those, four have severe consequences for the organization. That's where EdgeTek must focus its attention. The next step is for EdgeTek to identify the players associated with each event. Whose actions can precipitate the event? Who can influence it while it's under way? Who can help clean up the aftermath? Government trade bureaus that can provide incentives for companies seeking to train and hire unemployed people. While mapping, look at not just at organizations, but also individuals. Who specifically can be influential? This is where a network analysis can come in handy by identifying the strength of relationships between your company and those critical to the organization's future. Perhaps the organization has good connections with universities but only weak ties to local communities. Or perhaps the company's network shows strong connections to local organizations but weak links with government regulatory and support agencies. With this information, a company can put plans in place to develop the relationships that will help sustain the company in its ecosystem. We've Mapped Ecosystem Risks: Now What? What does understanding your corporate ecosystem mean practically for corporate leaders? You must look beyond your own company. You can't live in a bubble. You need to be aware of what's happening in the outside world, particularly in ecosystem organizations. Furthermore, you need to become competent at hypothetical thinking. For example, what if that potentially disruptive event occurs? What would the corporation need in order to respond? You must pay more attention to relationships within your ecosystem. Get in front of the people with the power to significantly impact your organization's health and sustainability. Not only do you need visibility, you also need strong relationships, not just with stated partners, but also with the entities that have the power to significantly disrupt or sustain your business. If that means taking more time with headhunters, supply chain partners or union groups, so be it. It may also mean taking the time to discuss the state of the industry with ecosystem partners, cosponsor conferences, hammer out mutually beneficial deals or find ways to collaborate with competitors. You must be flexible. The beautifully articulated plan developed last year might not work when the business environment changes. When a fire at a Philips Electronics plant in 2000 slowed delivery of cell phone chips to customers Nokia and Ericsson, Nokia dispatched 30 employees to Philips to help restore operations. Was deploying resources to Philips in Nokia's plan? No, but it achieved the results Nokia needed: getting its products to market and achieving its sales plan for the year while Ericsson faltered. Ecosystems aren't going away. Instead, they're becoming increasingly complex as companies become more deeply entangled and supplement their core competencies by developing strong alliances and partnerships. The good news: For those with foresight and creativity, your ecosystem can help your company thrive. Maya Townsend is founder and principal consultant of Partnering Resources. For more information, visit www.partneringresources.com or e-mail maya@partneringresources.com.